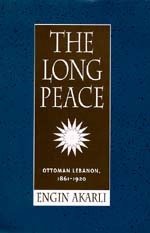 Long notorious as one of the most turbulent areas of the world, Lebanon nevertheless experienced an interlude of peace between its civil war of 1860 and the beginning of the French Mandate in 1920. Engin Akarli examines the sociopolitical changes resulting from the negotiations and shifting alliances characteristic of these crucial years. Using previously unexamined documents in Ottoman archives, Akarli challenges the prevailing view that attributes modernization in government to Western initiative while blaming stagnation on reactionary local forces. Instead, he argues, indigenous Lebanese experience in self-rule as well as reconciliation among different religious groups after 1860 laid the foundation for secular democracy. European intervention in Lebanese politics, however, hampered efforts to develop a correspondingly secular notion of Lebanese nationality. As ethnic and religious strife increases throughout much of eastern Europe and the Middle East, the Lebanese example has obvious relevance for our own time. Engin Deniz Akarli is Professor of History at Brown University.